For decades, dentists have relied on dental crowns to repair damaged smiles and preserve healthy tooth structures. While the creation methods and materials have improved through the years, the idea remains the same. If patients have enough dental structure left to support a crown restoration, there’s no need for them to lose their entire tooth. Today, we can also use dental crowns to protect root canal treated teeth, as part of the tooth replacement process, and for cosmetic improvement. In fact, many dentist’s offices even offer same day dental crowns to make the restoration process a breeze. Patients who have tooth decay or damage too severe to be repaired with a more conservative restoration like a tooth-colored filling will likely need a dental crown. We also use dental crowns regularly to replace fillings that have broken down over time. In many cases, dental crowns make it possible for us to protect a tooth that would otherwise need to be extracted. Following a root canal, the tooth is susceptible to damage. Removing and replacing the inner layer of the tooth does weaken the overall structure. However, by placing a dental crown, the density and strength of the tooth is improved, protecting patients from further damage and decreasing risk for root canal failure. Dental crowns can be attached directly to an implant post to replace a single tooth. Crowns are also essential to the function of fixed bridge tooth replacement. These prosthetics use two dental crowns, one on each side, to support a replacement tooth. Then, the dental crowns are affixed to surrounding healthy teeth, holding the replacement tooth in position. Many patients aren’t aware that one or more dental crowns can be used as part of a cosmetic dentistry plan. 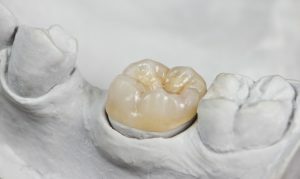 Crafted from high quality porcelain, crowns can be used to reshape teeth, fill in gaps, or conceal discoloration. In order to avoid unnecessary loss of healthy tooth structure, we will not likely recommend dental crowns for more than a few teeth as part of a cosmetic dental care plan. Dr. Shiloh Lindsey has years of experience offering custom crafted dental crowns to repair, enhance, and transform the smile. Aspen Dental Care is happy to offer E4D same day restorations for patients who want to repair their smiles without the hassle of scheduling multiple office visits. If you want to find out more about dental crowns or any of our other services, please contact us to schedule a consultation in our Ft. Collins dentistry practice. You can check out our blog regularly for the latest information about professional dental services and how best to care for your smile every day of the year.